The Oxford or “Oxford Down,” originated in Oxford County, England. The breed was the result of crossing Cotswolds and Hampshires. 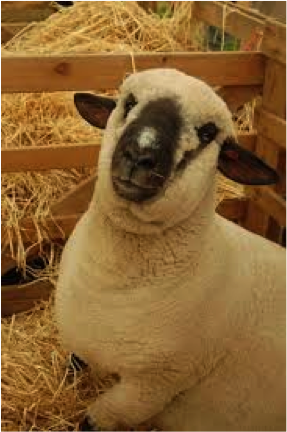 It has been contended that very early in the development of the Oxford breed, a small amount of Southdown blood was introduced. The breed has never become prominent outside of its own native area in England. Oxfords have been exported to many major sheep countries. 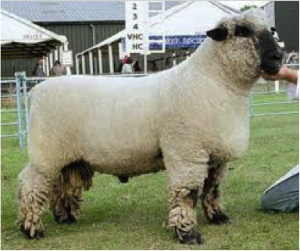 The Oxford is one of the largest breeds of sheep . It produces the heaviest fleece of any of the Down breeds. In the U.K., it is a specialist breed to cross with commercial crossbred ewes for meat production. The first Oxfords were imported to the United States in 1846. They are a relatively minor breed in the U.S.
Oxfords have suffered quite the roller coaster of history. Oxfords originated in the 1830’s in Whitney, Oxfordshire, from a cross between Hampshire and Shropshire ewes and Cotswold rams to take advantage of very fertile forages. A few decades of breeding for type and breed registration occurred in 1862. The impressive and highly successful sheep caught American attention and landed in North America in 1846, with its own breed association in 1882. It spread all over North America exceptionally quickly. Oxford populations skyrocketed, despite competition from Hampshire and Shropshire flocks, to become the third most populous sheep in the United States. The Oxford owes its success to both its meat and its wool. By the 1930’s, shepherds wanted a slightly more compact, more marbled sheep for the growing lamb market and smaller Oxfords, with more wool, were selected and bred. Unfortunately, the newer sheep weren’t as popular and their numbers dropped. All those changes were not for the better. The meat was too fatty, the wool to short and dense. Thankfully the trends of fashion left the Oxford, and the wisdom of old Oxford breed characteristics returned. An infusion of Scottish Oxford blood, combined with breeding back to the old standard for shepherds who still had the old bloodlines, restored some of the original characteristics and their popularity grew once more. Oxford prior to 1900 were very large, blocky animals (to say they were built like a brick house might not be a stretch). They had wide backs, were nearly black in color (you heard that correctly) and had a small topknot of wool on their heads and upper legs. Mature rams commonly weighed in at over 400 pounds, making them the largest down breed by far. They had a coarse, loose fleece that weighed from 12-20 pounds in a year’s clip and the sheep grew quickly and are well muscled, and ewes have heavy milking tendencies. The new breed that we know as Oxford today is a bit smaller, only 200-250 pounds, a result of that push in the 30’s for a more compact animal followed by the resurgence of the older type. But the other characteristics are the same as the old breed: They remain broad, barrel shaped animals with uniformly dark faces, legs and ears, ranging from a steel grey to a very dark brown – but not black. They are excellent meat sheep, with heavy muscling. They are excellent milkers and mothers, and they still have clean faces and legs with a wooly top knot. Oxford fleece should be compact, and uniform with a good staple length, generally around 1-2”. The locks should be so dense and tight that you cannot close your hand and grab the wool. The fleece is white, with no black fibers allowed, with sufficient yolk to keep it in condition and should weigh 10-12 pounds for a year’s clip.